For anyone who hasn't yet joined the Quilt-a-long, it's not too late. Here's the first post and here's the http://www.flickr.com/groups/lilysquilts/Flickr group. Open to anyone and everyone and all abilities. 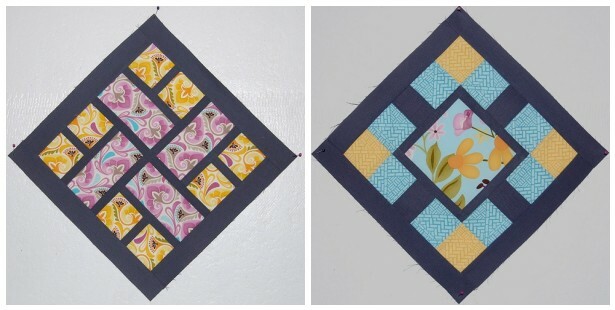 In this month's Ringo Pie bee, Penny sewtakahike asked for kitcheny blocks so, after some umm-ing and ahh-ing and churning of ideas, I made the block below. I had a chat with my 11 year old son, Jack, about the block before I started and once it was done. Jack: why are you googling images of coffee pots? Me: for a bee block. Jack: That's stupid. Me (some time later, after much wailing, gnashing of teeth and ripping of seams): So, what do you think? Jack: What is it? Me: What do you think it is? Jack: a lady with one broken arm, a small head and an ugly dress. I then had two blocks to make for Allison Pioneer Valley Girl. She's designed a set of blocks to be used with a layer cake and they're fun to make and a great way to practice accurate piecing. She sent us Kona coal and Kate Spain's Central Park. And finally I have to say that the excitement of seeing someone else make Hexagon Park is not yet dying down. Look at this fabulous version Agnieszka (aka Tusens), who blogs at a quilt, maybe, made using a Pure layer cake. On first look with out reading the post I saw a magnificent coffee mocha pot (which is fantastic by the way) and I was studying it very closely to try and work out how you did it and I was very impressed. Now after reading your post I see a Strange robot lady with one arm!!! Beautiful!!! I can't wait to make my own Hexagon Park!! lol the conversation with your son cracked me up!! The coffee pot looks great! I have seen nothing made with Pure that is not absolutely gorgeous. I have one set of Charms....I need yardage, don't I? Love that coffee pot/broken armed lady! (looks like a coffee pot to me). I can just hear my son saying something similar. I love the coffee pot! I also love the quilt, she did a wonderful job with your excellent pattern. well your son is hysterical!!! i love the coffee pot it is gorgeous. you are super talented!!! The coffee pot is fantastic! The quilt is going to be so sweet! I love your little talk with Jack ~ and his take on your block, which is, by the way, brilliant! I'd love a tutorial on it! Oh I wished my real coffee pot would look like this. your coffee pot is fantastic but laughed out loud when i read your sons description .. actually i think i see a face in that coffee pot lid. and the two blocks for Pioneer Valley Girl are fantastic! Love the Hexagon Park with that one pink colored one on the right. And of course that coffee pot..pure genius! Lynne, thank you so much. And thank you all for your lovely comments about my quilt top. And as I said your blocks for Allison are perfect - the design is beautiful but I imagine also quite demanding. What a fun post. The coffee pot is great. And the conversation made me laugh out loud! The coffepot is awesome, but I see your son's point. This is going to sound really stupid, but I'm kind of new to the whole online quilting scene: what are bees, exactly, and how does one become part of a bee? That is one stinkin' amazing ugly dress block. I totally remember that from "Lost In Space". Love the "Ugly dress comment" my husband asked me what was so funny as I was LOL, so I read the conversation to him, and he cracked up too. Both of us at the same commented on how kids nowadays, have never seen a coffee pot like that. thanks for a great laugh. I have to say I saw a robot at first then the coffee pot but when Jack said what he did I laughed and laughed outloud! Love the Hexagon Park quilt--the red square is just the kind of unexpected move that I hesitate to make in my quilts, and always admire in someone else's. Way to go! You know it's an excellent pattern when quilters can use so many different fabrics and get such great results. Haha Lynne your coffee pot block is sooo good! I think I want one for my kitchen!! On 2nd look I actually saw what your son saw too, 2 blocks for the price of one!! Oh to see out of the eyes of a child again!!! 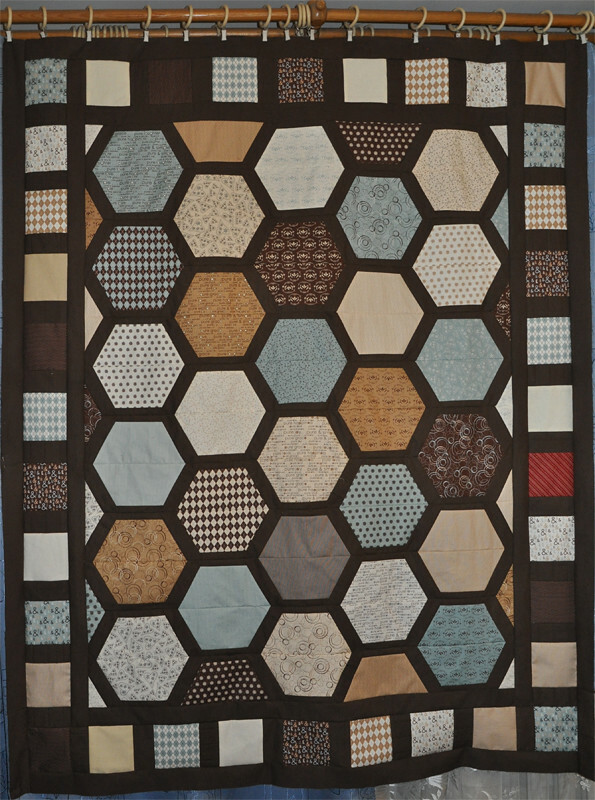 LOL Love the hexagon quilt and have seen it in pastels. 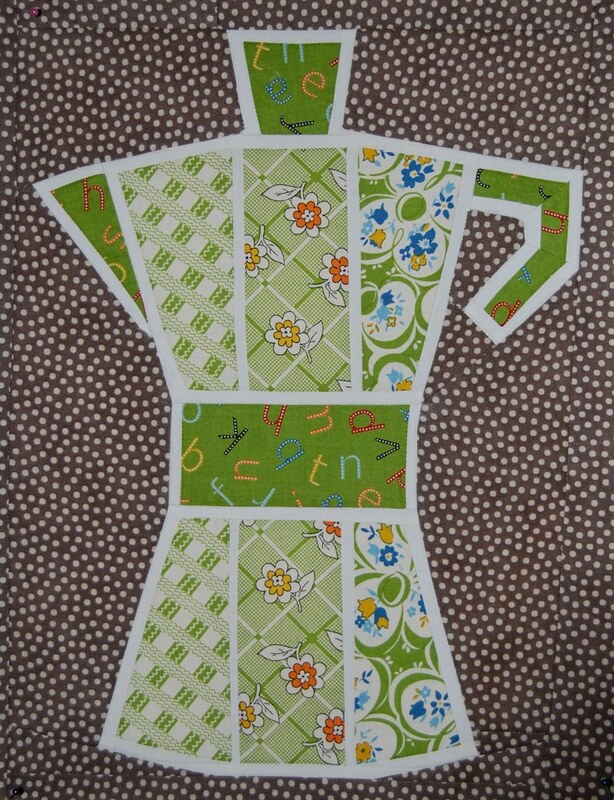 Are we all making coffee pots or robot ladies this week? your son's commentary is hilarious. Kids eh! Lovely piece of work.